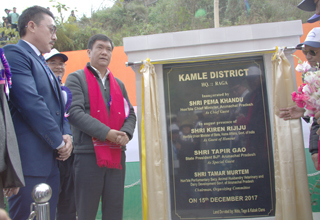 RAGA, Dec 15: Chief Minister Pema Khandu on Friday inaugurated the 22nd district of the state, Kamle, at the Yada ground here, fulfilling the promise he had made during the Golden Jubilee Boori Boot Yullo celebrations in February this year. The district, with its headquarters at Raga, will have six administrative units -Raga, Kamporijo, Dollungmukh, Puchi-Geko, Gepen, and a portion of Daporijo sadar circle – consisting of all the villages falling under Raga assembly constituency, including Ligu and Liruk, which were until now under the administrative control of Upper Subansiri district. The chief minister appealed to the people here to be part of the development process. “Voluntarily donating land for infrastructure development will speed up the phase of development of this area,” he said, and assured that funds for the purpose would be placed in the next budget. Emphasizing on connectivity to develop the district, Pema cited the ongoing Trans-Arunachal Highway as a “major catalyst.” He, however, expressed regret that construction of the portion of the highway connecting Raga is getting delayed, mainly due to land compensation issues. He requested the people to cooperate with the authorities. “I have been informed that almost all cases of compensation have been resolved. We will be now able to hand over the required land for work on the project to take off,” he informed. Pema also assured to sanction a water supply project worth Rs 16 crore in Raga. He meanwhile lauded the efforts of local MLA and Parliamentary Secretary, Tamar Murtem, for his perseverance and persuasion for the creation of Kamle district. Murtem on his part expressed gratitude to the chief minister for fulfilling the 25-year-long dream of the people of Raga by creating the district. “The people of Kamle district will remain indebted and shall take your name with reverence forever,” he said, and called on the people of the district to work together to make the district a model one. He requested the chief minister to provide funds for construction of a mini secretariat, the DC and SP bungalows, and establishment of an ADC headquarters near Daporijo (for the convenience of the people of Sigin, Paat and Chikom blocks, which were erstwhile in Upper Subansiri). Also drawing attention to the destruction of tourist resort buildings at Dollungmukh, Murtem requested the chief minister to resolve the boundary issues with Assam at the earliest. MoS for Home, Kiren Rijiju, Parliamentary Secretaries Likha Saaya and Tage Taki, Deputy Speaker Tumke Bagra, former MLA Talo Mugli, Divisional Commissioner Gamli Padum, and the Chairman Kamle District Demand Committee Chairman also spoke.